And Discover The Greatness In YOU! ON A SOLID ROCK FOUNDATION! Get more from your drumming career at Time Space And Drums! 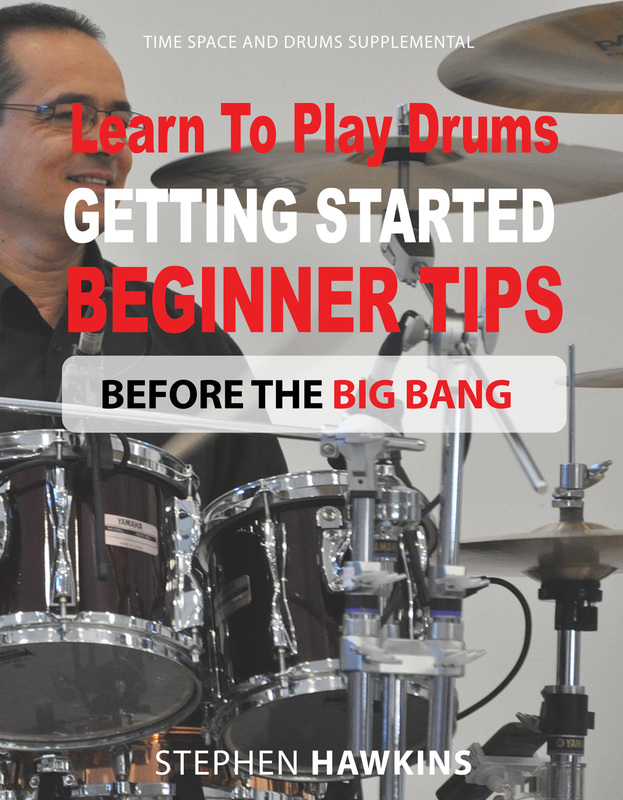 Begin building your ROCK SOLID Foundation of Drumming Skills TODAY! 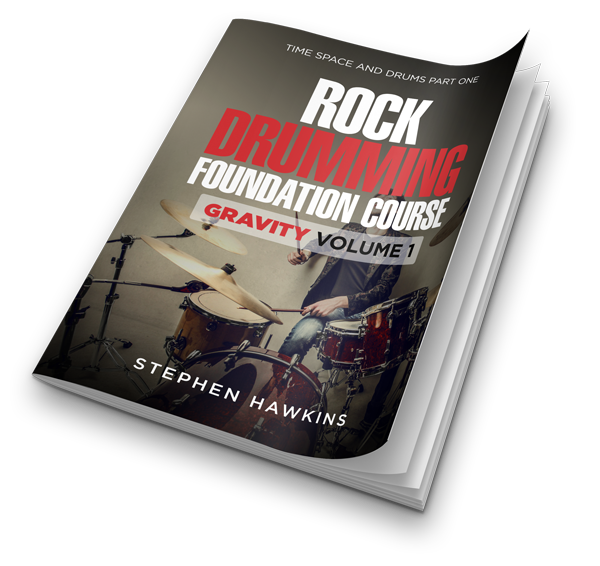 Stephen Hawkins encapsulates the essence of drumming in the first of 12 books from the Time Space and Drums Series titled: ROCK DRUMMING FOUNDATION: - Gravity Volume 1, In which he covers the six essential drum rhythms every drummer will be playing throughout his/her drumming career and by using 1/16th note drum fills to integrate the six rhythms, this six lesson program brings balance and flow to the beginning drummers arsenal of skills. With a central theme of "working on the SCIENCE of drumming" this first book in the series pathes the way to building a solid rock structure in the future. Learning how to read music is an integral part of the book so the student drummer will have the basic fundamentals of drumming from the beginning. And of course, you can download demonstrations by registering here. The core of the Jazz Drumming style gets integrated into the students arsenal in the second book from the Time Space and Drums series titled: JAZZ DRUMMING FOUNDATION: - Gravity Volume 2: In which Stephen covers the three essential jazz style drum rhythms every drummer will be called upon to play over the span of his/her drumming career and by using 8th note triplet drum fills to integrate the three rhythms, this six lesson program brings integration with book 1 with the addition of more drum fills. Again, the central theme of "working on the SCIENCE of drumming" is the core of this book as it too pathes the way to building a solid jazz style drumming structure into the student drummers future. Reading music is still an integral part of the book so the student drummer will further advance the basic fundamentals of drumming theory. And of course, you can download audio demonstrations by registering here. 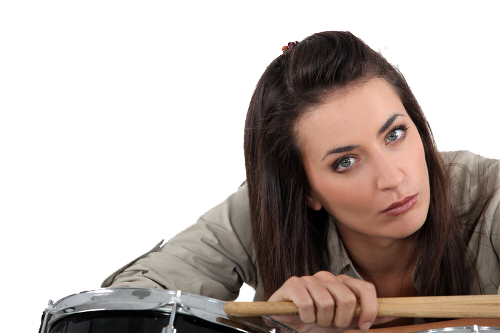 You don't need an expensive drum tutor to achieve your goal to become a Great Drummer! What you do need, are the right instruction's and the right tools that will take you Directly to your goal! In a Fraction Of The Time! Written Exercises are a Vital part of learning to play the drum especially those exercises that matter the most. To help the beginning drummer get a deeper understand of drumming, training the ear to listen is vital, especially when written exercises are part of the learning. An Experienced Drummer and Tutor who provides simple expert guidance is more or less a guarantee that you will receive the knowledge that counts the most. Practicing what matters when it matters through a Proven Practice Schedule and development plan ensure's you do what needs doing when it needs doing. One of the most important characteristics for a drummer just starting out is having the Determination To Succeed! To start and complete your studies and practice. Clear, compelling instruction enabling you to catapult your skills to a whole new level. We have created a 12 part integrated series that enable you to learn "how to play the drums" from the ground up. Each part builds on the previous part to increase your skills exponentially. Master The ART Of Leaving Space. The Time Space and Drums Series was designed to bring that drummer out into the world. We recommend you follow the program through from the beginning to the end one part at a time until you have complete mastery over the techniques. Begin with your Rock Drumming Foundation Course. You may also wish to subscribe here to download the free audio demonstrations that come with each course book. Start building your drumming abilities at Time Space And Drums! Copyright 2016 © timespaceanddrums. All Rights Reserved.